DA LUNEDÌ 22 LUGLIO UN NUOVO AUMENTO DEL COSTO DEI TRASPORTI URBANI, IN DUE ANNI QUASI IL 20%. 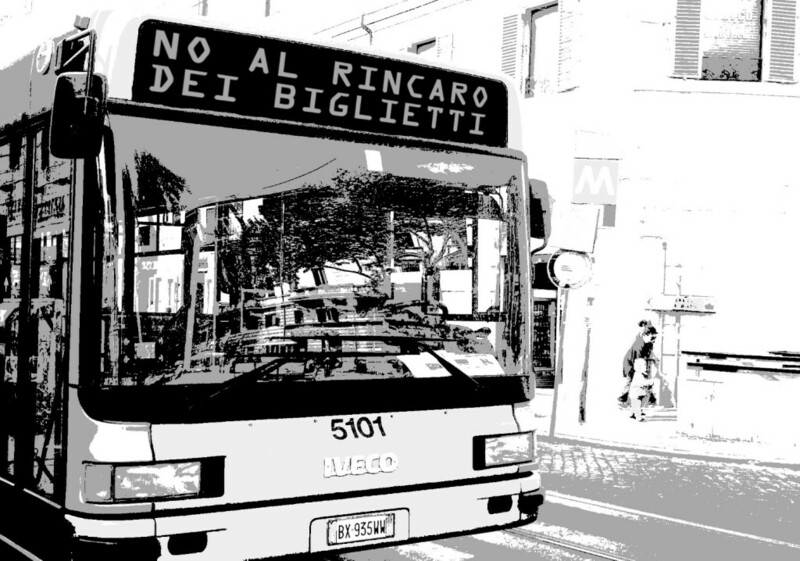 RIVENDICHIAMO IL DIRITTO ALLA MOBILITÀ PER TUTTI. FASCE ORARIE GRATUITE PER DISOCCUPATI E CASSAINTEGRATI. IL TRASPORTO PUBBLICO VA INCENTIVATO INVESTENDO SUL SUO RAFFORZAMENTO, RIDUCENDONE I COSTI PER GLI UTENTI. PIÙ TRASPORTO PUBBLICO = MENO MACCHINE = MINORE INQUINAMENTO = MENO MALATTIE.